​A Palestinian man claims he was tricked into selling a Banksy mural worth thousands of pounds for a mere £118. The work had been painted on the door of his bombed-out house. Banksy is believed to have infiltrated Gaza via Egypt earlier this year at considerable personal risk through an underground tunnel. He painted four murals including one of the Greek goddess Niobe, who is pictured cowering amid the devastation left by Israeli bombing carried out last summer. Her image was painted on a steel door, which was all that remained of the home of Rabie Darduna, 33, and his family who had been displaced during the war. Banksy artworks are regularly valued at hundreds of thousands of pounds, but Darduna, who claims he was unaware of the door’s value and even of who Banksy was, sold it to a local artist for around £118. 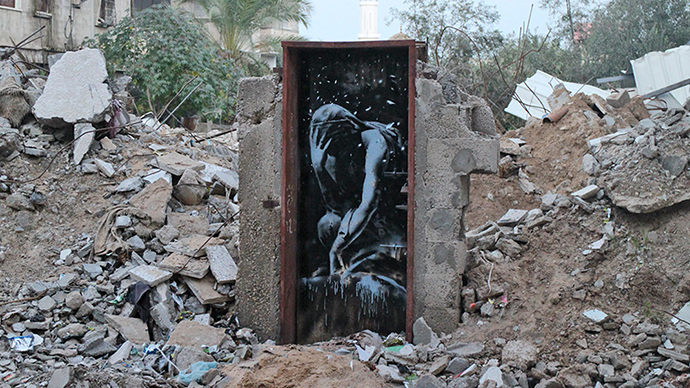 Banksy has long been a critic of Israeli policy, undertaking various projects in Gaza and the West Bank over the years. During his most recent trip the artist shared his personal thoughts on the situation confronting the people of Gaza. “Gaza is often described as ‘the world’s largest open air prison’ because no one is allowed to enter or leave. But that seems a bit unfair to prisons – they don’t have their electricity and drinking water cut off randomly almost every day,” Banksy said in a spray-painted statement. The Darduna home was one of 18,000 destroyed after July 8, 2014, when Israel launched Operation Protective Edge against the Hamas-ruled Gaza Strip. A UN report published last week found more Palestinian civilians died as a result of the Israel-Palestine conflict in 2014 than in any year since 1967. The report, published by the United Nations Office for the Coordination of Humanitarian Affairs (OCHA), said Israel’s Operation Protective Edge resulted in the death of over 2,220 Palestinians, 1,492 of whom were civilians. In what the OCHA described as the “worst escalation of hostilities” since the Six-Day War in 1967, 71 Israelis were also killed, 66 of whom were soldiers. The stated purpose of the Israeli operation was to stop rocket fire from Gaza into Israeli territory.